for high-end devices like Android-powered phones, iPhone, iPod touch, and Palm Pre. If you use Custom Search, your visitors can now search your website from these mobile devices. Mobile users will also benefit from the features we recently launched, such as structured Custom Search and themes, and other presentation features, such as touchable tabbed refinement labels, promotions and rich snippets with thumbnails and actions. Here's a screenshot from the new Droid phone. If you have one of these high-end phones in your pocket, try it out now. You can find information on Custom Search with our handy CSE mobile search [URL: http://googlecustomsearch.appspot.com/cse]. Bookmark this on your phone, and you'll have Custom Search information literally at your fingertips. Search for [snippets] or [promotions] or [mobile] to give it a test-drive. You no longer need to repurpose your content to mobilize your web site. You can use the Custom Search home page that we create for you as the preferred mobile entry point for your website. If you select a theme for your search engine, your mobile home page will automatically use it. If you switch to a new theme in the Custom Search control panel, your mobile users will immediately see the change. Mobile results will also display thumbnails and actions if you have marked up your pages. Your mobile users will just need to type a query to find the best result. Using their smartphone, they can navigate your website using search! We recently announced support for mobile Custom Search for high-end devices like Android-powered phones, iPhone, iPod touch, and Palm Pre. 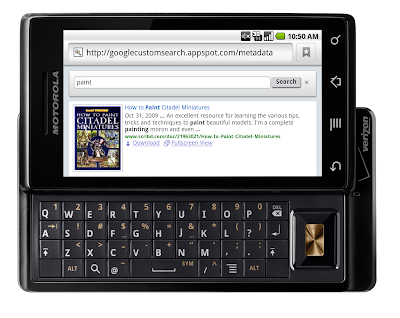 If you use Custom Search, your visitors can now search your website from these mobile devices. Mobile users will also benefit from the features we recently launched, such as structured Custom Search and themes, and other presentation features, such as touchable tabbed refinement labels, promotions and rich snippets with thumbnails and actions. Here's a screenshot from the new Droid phone.